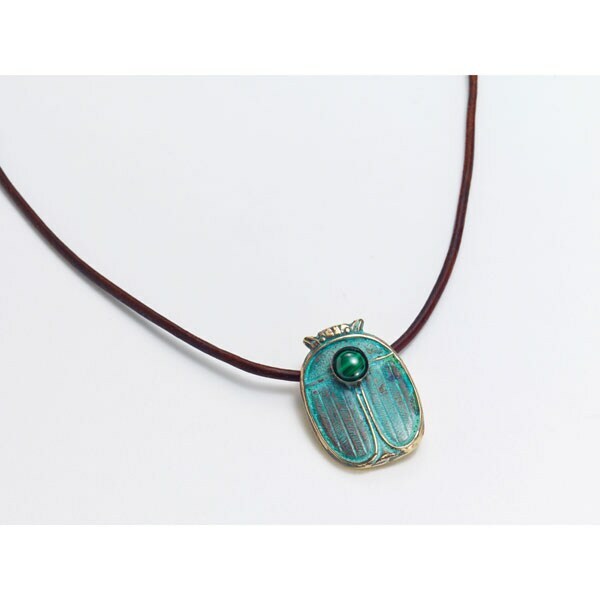 The ancient Egyptians were mad about scarabs and used them in everything: jewelry, art, amulets, seals. Jewelry designer Elaine Coyne puts her own stamp on this enduring symbol of rebirth, crafting memorable pieces from green patinaed brass and polished malachite cabochons. 1" wide cuff bracelet is slightly adjustable. Necklace is a 1" pendant on a 18" black leather cord with lobsterclaw clasp. Earrings hang 1 1/4" on gold-plated leverbacks. Bracelet, necklace and earrings sold separately.